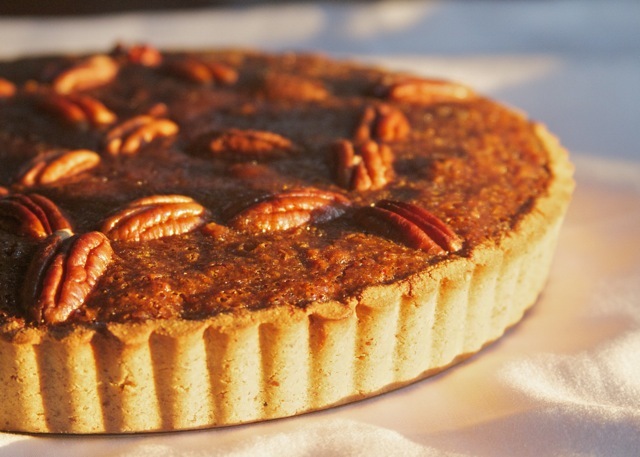 Texas has a robust pecan industry and, not surprisingly, pecan pie is very popular there. Not far from my hometown is the famous Collin Street Bakery in Corsicana, Texas. They have been using Texas pecans since 1896 in their fruitcakes, pecan cakes and pecan pies that ship all over the world. When I was growing up there, pecan trees, which are native to Texas, were in my front yard. I still remember the little old man coming over and using a “pecan picker upper” to harvest some from under our trees. A few days later he would show up at our doorstep with a homemade pecan pie just for us! It was his way of saying thanks and the gesture was much appreciated. Unfortunately, celiac disease or gluten intolerance means having to avoid gluten in a pecan pie even if it comes from a famous bakery, a nice neighbor or a well-meaning host at a party. If you want a standard pecan pie there are about a zillion recipes in cookbooks and online. But almost every one of them will have a wheat flour crust or, minimally, will be chock full of sugar, sugar and more sugar. “Low carb” recipes often have tons of artificial ingredients that make me think “why bother?” This recipe is different. 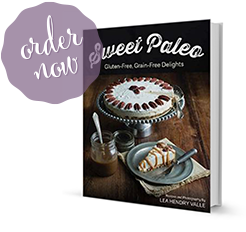 It is not only gluten-free but also takes into account my desire to stay as close to paleo as possible. So gone is the corn syrup, brown sugar and processed white sugar. The filling is sweetened only by dates, applesauce, pure maple syrup and a little molasses. Oh and there’s a bit of rum too. But that’s optional. Sort of. 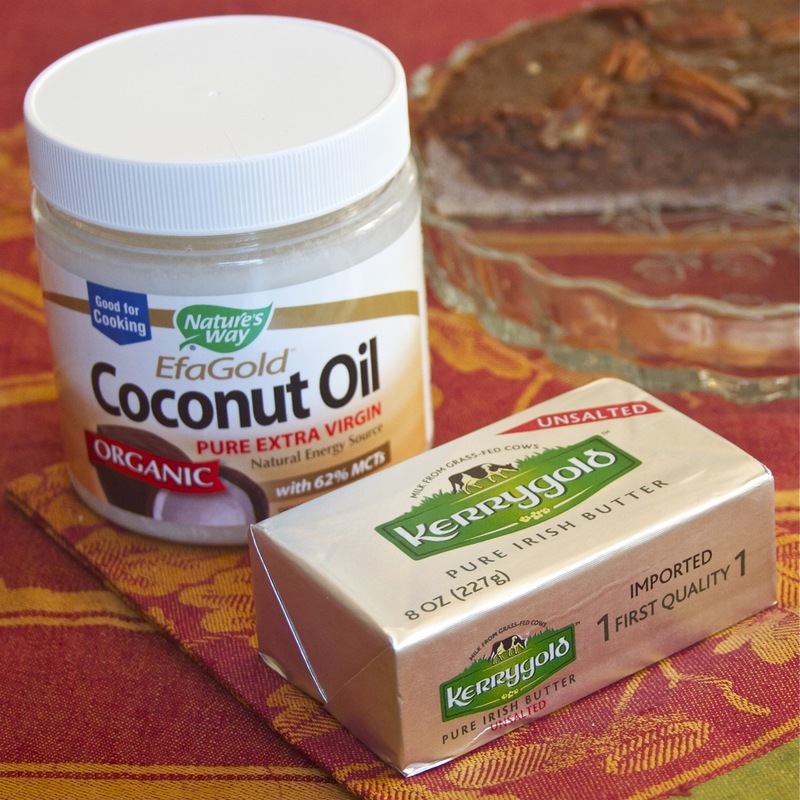 I used pastured butter in this recipe but coconut oil would work as well. 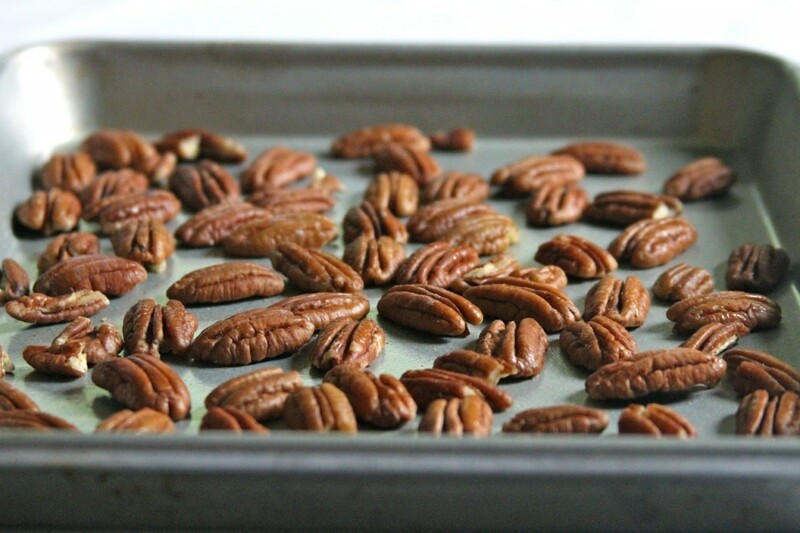 Toast the pecan halves (total of 2 1/2 cups) on a sheet pan in a 350 degree oven for about 7 minutes. Separate. Chop 1 cup plus 2/3 cup of pecans roughly in the food processor. Remove chopped pecans. Combine the coconut flour, 1/2 cup pecan halves, fat (either pastured butter or virgin coconut oil), coconut sugar and salt in food processor and pulse until combined and pecans are finely chopped. Add the eggs and pulse until a dough is formed. Spread the dough evenly into the bottom and sides of a 9 1/2 inch tart pan. Place the pitted dates in the food processor with the applesauce and maple syrup. Process until dates are completely puréed and you have a smooth mixture. To the bowl of a stand mixer add the date purée, eggs, fat of choice (butter or coconut oil), molasses, rum, vanilla and salt and mix on medium speed until well-combined. 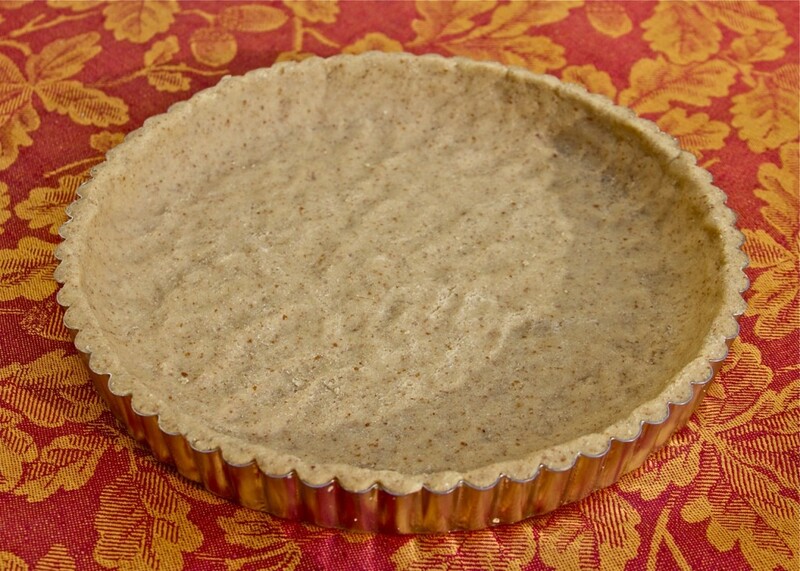 Place the chopped pecans into the bottom of the prepared tart shell. Pour the filling into the shell. Decorate the top with the remaining 1/3 cup of pecan halves. Place the tart onto a sheet pan and bake in the oven at 350 degrees for approximately 45-50 minutes. Check the tart at 30-35 minutes. 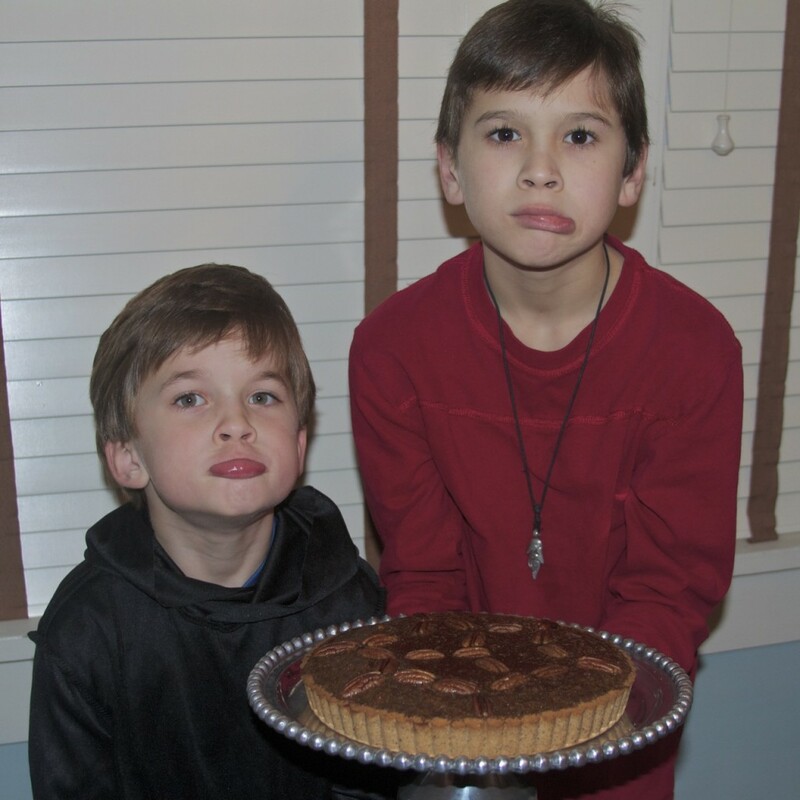 Serve the paleo pecan tart to anyone who is not allergic to pecans, like my boys, who were very sad and angry when I made it. I roughly followed my crust recipe for the Paleo Coconut Cream Pie replacing the coconut flakes with pecans. The crust is not very sweet but with the sweet filling there is a nice balance. I used more fat this time because coconut flour has a tendency to be dry and chalky. You can probably use a regular pie pan for this recipe making it a paleo pecan pie instead of a paleo pecan tart. But I liked using the tart pan because the crust is heavy-duty and makes a nice, firm shell for the gooey contents of the pie filling. The molasses is an important ingredient. 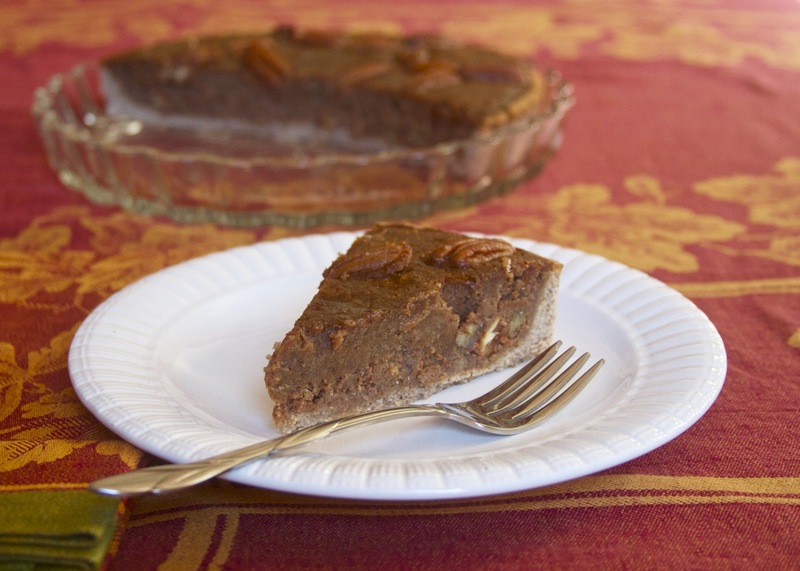 Even though the dates impart a nice caramel flavor, the molasses gave the paleo pecan tart that distinct pecan pie flavor. 44 Responses to "Paleo Pecan Pie / Tart"
Oh Yay! I LOVE pecan pie…I also grew up in Texas and am no stranger to those giant Texas pecans!!!! Most of my family is still in the south so when we take road trips down that way I make a special trip to Valley Pecans in Chillicothe, TX to stock up…I hate that they are not organic but they are just too good not to eat!!! Hello fellow displaced Texan! Testing this recipe brought back memories. Too bad I didn’t have any of those Valley Pecans beauties. Had to settle for Costco. I m also from Texas and know exactly where that Bakery is. But luckily we have a pecan tree in our front yard. I am very excited to try this recipe! Great. I hope you like it. 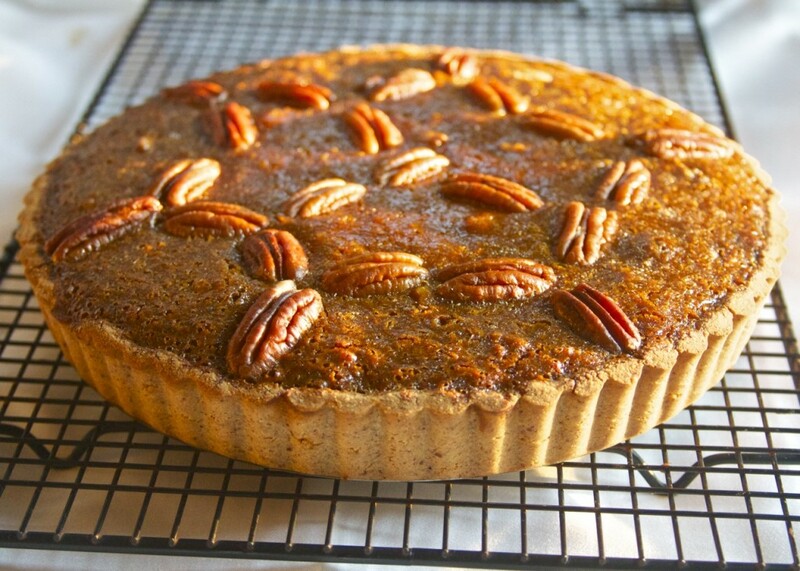 The texture is different from a traditional pecan pie – more like a tart. But I love that it is far more guilt-free. Wow, this looks great! I will be making this recipe indeed! Thank you! Great recipe! FYI for anyone planning to make this, I almost messed this up because there were never any instructions to remove the chopped pecans from the food processor (and separate it into the chopped pecans for the crust vs. for the filling). Also, I baked this for 40 minutes and the top was way darker than in your pics, and the tops of the crust a little burnt — so be sure to check in at 30 or 35 minutes to re-evaluate, though the recipe says 45-50 minutes. Thanks for the feedback. In the first instruction I did specify “separate” the pecans. But you are correct that I did not specify what to do after they are in the food processor. I changed the directions based on your suggestions including a note about the time. I REALLY appreciate the help because I want the recipes to be correct and easy to follow. 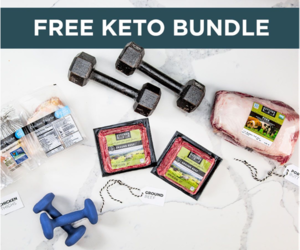 Thank you so much for posting this–I am so excited to try it! Looks incredible. I hope you like it! Let me know what you think. Thanks! it doesnt say when to put the coconut sugar in! im guessing with the flour and pecans when we process it to make the crust….?! Yes. It goes in with the coconut flour and nuts, etc and before the eggs. I’ll go back and add that in. Pam, it is definitely more firm and cakey than a traditional pecan pie – more of a tart actually. I would be interested in trying your suggestions next time to see what a difference it might make in the consistency. And you absolutely have to use unpitted dates for this recipe. I guess I should have specified that in the recipe. Thanks for the feedback. I’M MAKING this for a party tonight!!!! Any thoughts on the volume of the pecans once they would be ground down in the food processor? I understand they’re supposed to be ground together with the other ingredients for the crust, but I’m thinking of subbing almond flour (just for the crust). Thanks! I used 2 tbsp almond flour instead of the 1/2 cup pecans… it’s in the oven now! Just saw your comments. Glad you came up with a solution. My only thought is that maybe the 2 Tbsp of almond flour ends up making the crust less fatty than the full 1/2 cup of pecans and maybe that alters the cooking time? Not sure. I used a tart pan which I think makes a difference in everything cooking more evenly. It’s amazing how some people think this pie is really sweet and others are surprised at how much less sweet it is than a traditional pecan pie. Our tastes can really be different can’t they! So glad you tried the recipe and I really appreciate all the good feedback. I made it this evening. It made the house smell wonderful! Could you tell me, is the filling suppose to be gooey or more cake like? I wasn’t really sure how to tell if it was finished baking. I checked it at 33 min. then again at 43, then it was in for the total hour. I’m thinking that I left it in a little longer than I should have. But the real question is, should it be gooey or cake like? It tastes wonderful!!! It is not as gooey as a regular pecan pie but not like a cake either. When I’ve made it the filling was soft and very moist but not runny. It’s more of a tart, I guess. One hour cooking time may have been a bit long and it could have dried it out a little more than intended. But it doesn’t sound like that’s a problem if you liked it. 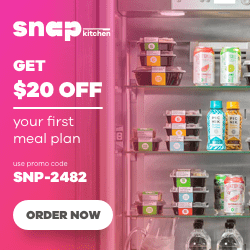 If you scroll all the way to the bottom of the post there is a “print friendly” button that will allow you to just print the text of the recipe without photos or other text. Don’t have any cocconut flour.. what would be the best replacement? Almond meal? Also, would it be fine to use to replace cocconut oil? (Other than the fact that it is not paleo). Cheers, looks absolutely delicious might I add, can’t wait to try it out! OK thanks. Is coconut flour just ground up cocconut? I don’t recommend trying to make your own coconut flour. It’s just coconut flakes ground up. This was delicious- thank you for a healthier alternative to my husband’s favorite dessert! this looks so yummy but i dont like pecans what other nuts can i use ? Hmm. Well, You could use almost any nut for the crust. For the tart itself you could try using almonds. I think that might work similarly well. Good luck. I’m Diabetic, how can I replace the sweeteners you use with Stevia? Unfortunately, I’m not sure it is possible in this recipe. I don’t have experience cooking with Stevia so I’m not able to provide advice.